The D-40’s timeless appointments include a vintage style rosette, tortoiseshell pickguard, white ABS binding, and Guild’s peak logo inlaid on the headstock. 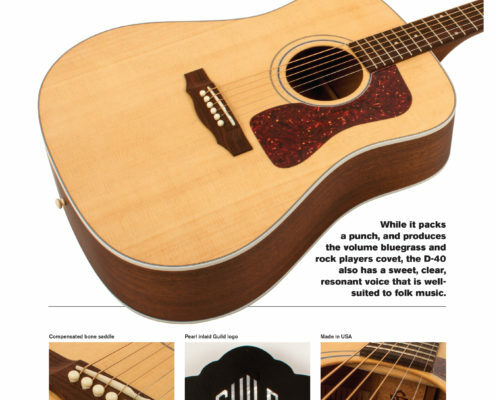 Each D-40 comes with a hand-signed, numbered certificate of authenticity, and ships with a Guild archtop wood case with a built-in Humicase® humidification system. Finish options include satin varnish in Natural, or Antique Burst with Cabernet back, sides and neck. A discreet, USA-made LR Baggs Element VTC pickup is also available (D-40E).